The unstoppable duo of Wendell and Domenick win the awesome-to-watch spool dropping Reward Challenge and choose Laurel on their Fijian excursion to deliver school supplies (and dine on chocolate cake and fried chicken). It's very clear those two men are running the game and the tribe begins to ponder making the big move. Only problem: Laurel is reluctant to betray her friends, eventhough she knows that's the move to make to win. 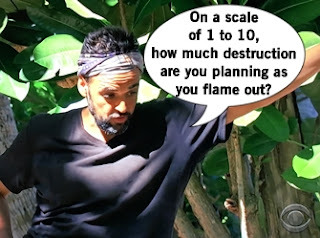 Donathan is frustrated by his likely fate, so he tries to stir things up between Domenick and Wendell, which only tips them off that Donathan is going to attempt to make a move. 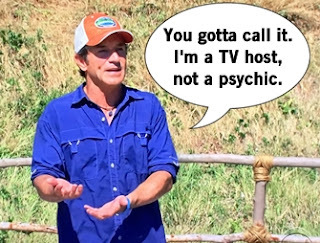 Meanwhile, Sebastian gets sent to Ghost Island and gets the steal a vote that sent Michaela home on Game Changers and Kellyn misplayed two votes ago, which is a pretty sick burn. Wendell loses the Immunity Challenge to Laurel after he forgets that Jeff Probst is not a mind-reader that knows when you finish your puzzle and you have to yell "Done!" Laurel feels bad about this snafu and doesn't think it's right to vote off Wendell when he could've won immunity. Woulda, coulda, shoulda, girl. Domenick and Wendell want to get rid of Kellyn because she's good a challenges and a threat to win. Donathan doesn't believe this is the plan and becomes paranoid that this is all a grander scheme to blindside him. Suddenly, someone who was barely a target on on the radar because they're becoming a loose canon. Classic Survivor! Tribal Council time! Probst brings up today's challenge and how the mental and physical exhaustion was clear today. Domenick recaps the earlier incident of rummaging through his bag which set Donathan off a bit. Donathan doesn't think his allies should withhold information from him, while Wendell thinks not everything has to be shared. Light whispers and nods begin to happen, saying to stick to the hammock plan. Donathan is fairly sure he's the one going tonight, but Kellyn still believes it's her (but would love if it wasn't). Will it be plan A, B, or C that happens tonight? Domenick receives 1 vote, but the remaining 6 votes are split between Donathan and Kellyn. 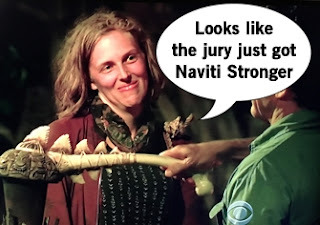 The tribe has a tiebreaker re-vote and the jury gets Naviti Stronger as Kellyn is voted out of the game.